Administrators can distribute reports once they have been generated. Administrators have four options for distributing reports or they can setup the Project Autopilot to send reports or allow managers to download their employee's reports. Option 1: Manually save or distribute reports. From the drop-down menu, select Reports>> Distribute Reports. From this page you will see that you can save the reports to a zip file and download them to your computer and/or email reports to targets, managers, or a specific email address. Select the option which you would like to use to distribute your reports. Choose if you show the reports from "This project only" or "All active projects". Choose if you will perform the action on "Reports selected below" or "All Reports in project". Select the appropriate expiration for the report links to be distributed. If you choose to select reports, select the reports you would like distributed. If you chose to "Package Reports in a Zip file" a link will appear for you to download the reports. If you chose to email the reports they will be queued for you to send when you are ready. Option 2: Setup the Autopilot to automatically distribute reports on a certain date. 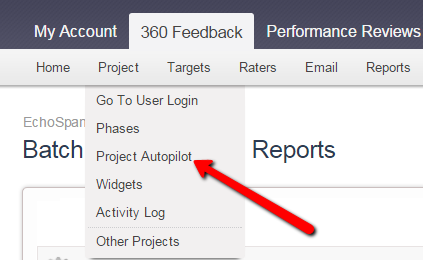 From the drop-down menu, select Phases>> Project Autopilot. Scroll down to the Reports section to see the option to turn on the feedback reporting phase for managers and email delivery options. Enter a date for the report distribution option you would like to use formatted as such MM/DD/YYYY. Option 3: Allow managers to download their employee's reports. You can turn on the Reporting phase that will allow managers, if marked as a manager group, to download their employee's reviews from their dashboards. From the drop-down menu, select Project>> Phases. Turn ON the Manager Reporting Phase. Don't forget, you should generate your target's reports before you turn on this phase. Option 4: Send managers a summary email with a link to login and view reports for all of their employees. Complete the steps from option 3, above. From the drop-down menu, select Email>> Summary Report Email. Choose to send the emails immediately or queue them to send later. Select the managers for which you would like to queue a summary report invitation and click "Create Selected Messages" OR click "Queue all Messages." This email template can be edited from the drop-down menu, select Email>> Edit Email Templates. Recipient = Other and Message Type = Summary Report Notification Email for Managers.